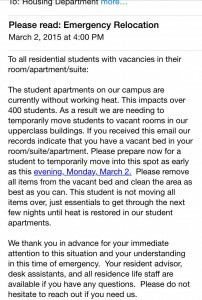 Update (March 3 – 1:30 p.m.): According to a Housing email, heat has been restored to Student Apartment buildings seven, eight and nine. Students in those buildings will have access to their temporary space until midnight. 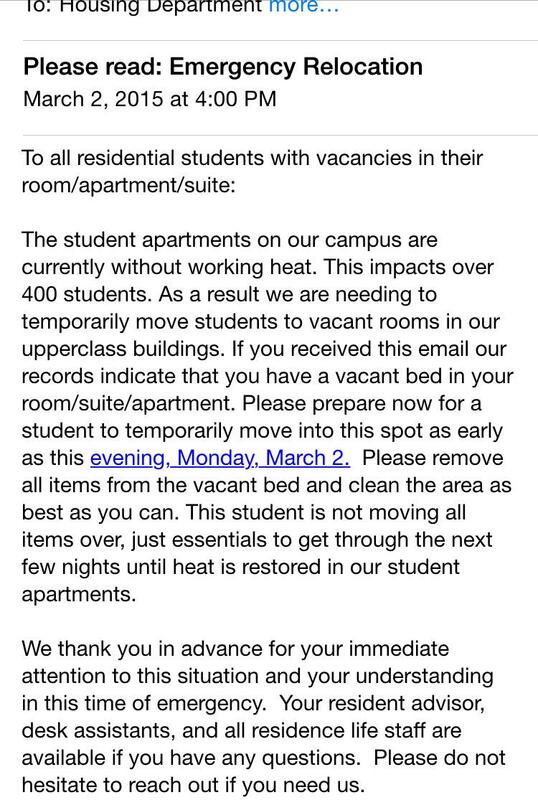 The email also notes that students returning to their buildings should use caution in avoiding taped-off areas of the apartment complex that are still being worked on. There was no timetable given at this time for the restoration of heat to the other apartment buildings. Mason Housing released an email (pictured below) this afternoon that over 400 students currently housed in the student apartments need to temporarily evacuate. This emergency relocation is called for because the heating system is not working. This move was necessitated by Housing because according to the National Weather Service, temperatures could reach a low of 22 degrees tonight in Fairfax. 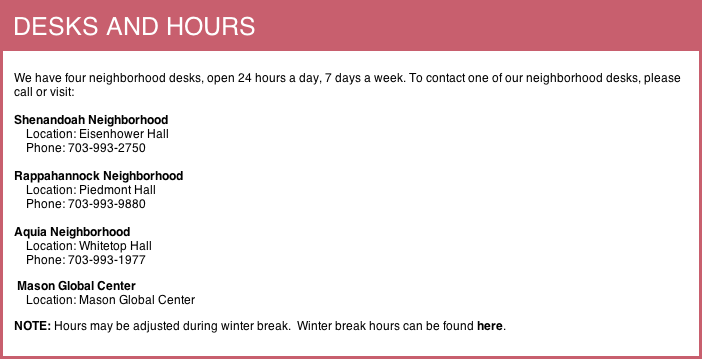 The email also said students can ask questions from “your resident advisor, desk assistants, and all residence life staff” or students can reach Housing and Residence Life. It has four neighborhood offices open 24/7. Below are their locations and phone numbers. Housing’s main phone number is 703-993-2720. Fourth Estate reached out to Mason Housing, but they were unavailable to comment at this time but would speak later in the day. This story is developing.